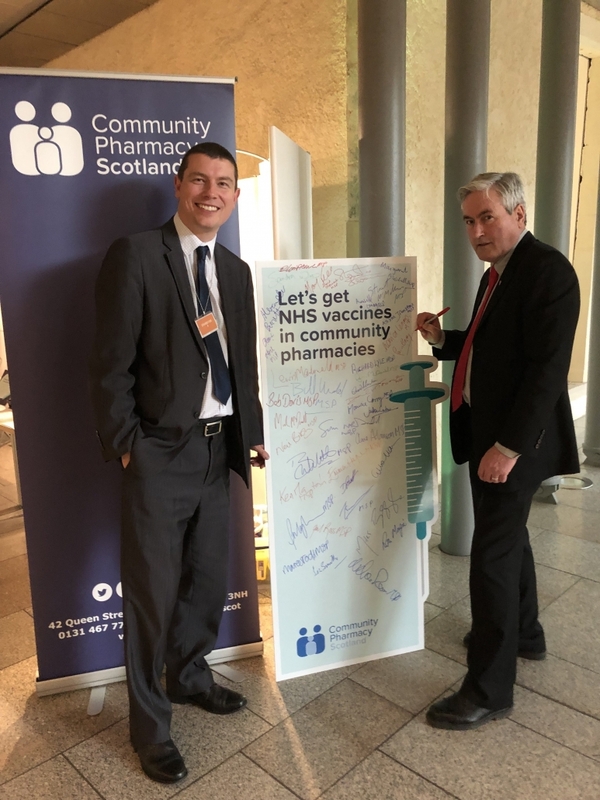 Iain Gray MSP was needled by health campaigners this week, but it was all in the cause of learning first-hand how our local pharmacies can help deliver a vital health service to the public more effectively. Unlike in England, highly qualified pharmacists are unable to administer flu vaccinations for the NHS – despite being well able to do so. And, in the view of Community Pharmacy Scotland, that means that Scotland’s hard-pressed GP services are coming under ever-greater pressure in their battle to balance a whole range of services. The pharmacists maintain that allowing them to help administer the flu jabs would help significantly in getting much closer to target levels amongst the most vulnerable populations who qualify for the vaccination, such as the elderly, pregnant women and people with specific conditions. 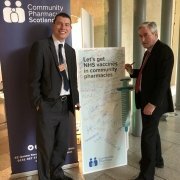 This has prompted Community Pharmacy Scotland clinicians to take to the Scottish Parliament to show MSPs first-hand just how easily they could help, using a dummy medical arm just in case nervous politicians found their aim was off! “Our NHS is facing unprecedented pressures and this only gets worse over winter. Letting pharmacists administer flu jabs seems like an easy way to increase the number of vulnerable people receiving vaccinations, and at the same time reduce some of the pressure on GPs and other NHS services. “Last year the number of people suffering flu doubled from the previous year. Our vaccination rates fall well below World Health Organisation targets, and we’ve never managed to vaccinate more than 61% of ‘at risk’ adults under the age of 65.